Steven (Chicagoland, United States) on 15 June 2010 in Cityscape & Urban and Portfolio. The Lincoln Memorial Reflecting Pool is the largest of Washington, D.C.'s reflecting pools. Located directly east of the Lincoln Memorial, it is a long, rectangular pool visible in many photographs of the Washington Monument. Part of the iconic image of Washington, the reflecting pool hosts many of the 24 million visitors a year who visit the National Mall. It is lined by walking paths and shade trees on both sides. 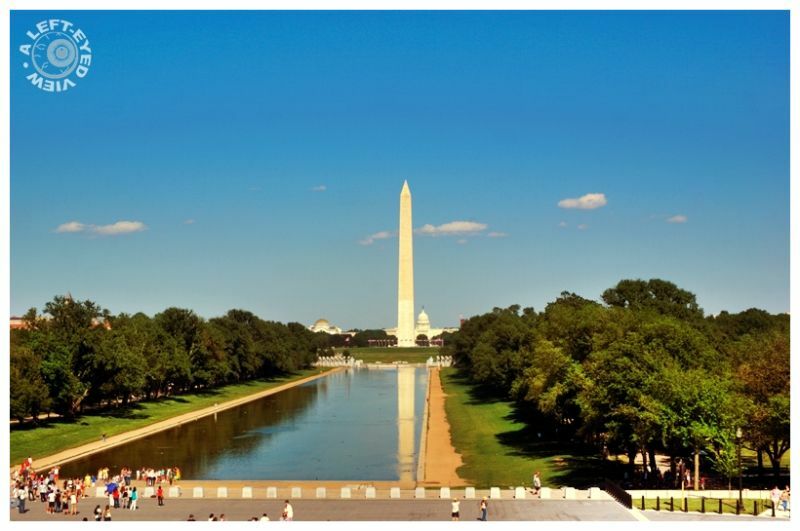 Located on the National Mall, the reflecting pool is approximately 2,029 feet long and 167 feet wide. It has a depth of approximately 18 inches on the sides and 30 inches in the center. It holds approximately 6,750,000 U.S. gallons of water. It was designed by Henry Bacon and constructed in 1922 and 1923, following the dedication of the Lincoln Memorial. Another great shot of your tour to the Capital. It makes me want to travel, again. I suddenly realized that we got the same egyptian architecture Place de la Concorde in Paris ! This one is much taller however. Great POV which gives a good idea of how huge is the place. Must be one of the most-photographed views around but, each time, it comes up different and yours has a fascinating postcard feeling about it as if it has just landed on the doormat ! Beautifully caught ! great reflection , very nice POV to get this reflection . Classic! Best weather for this kind of shot! straight forward and right on ! Pure picture postcard perfection Steve. This is fabulous! A truly gorgeous image. Classic and as always thank you for the little blurbs with the photos! We are going there, July 4th!!!!!! beautiful shot! Should be in a magazine! Perfect! Love the angle you chose to shoot this. That reflection really makes the shot. Wonderful image and great sky also! A superb photo. Have a lovely afternoon Steven.